JDM Countertops, Inc. offers guidance through the entire process of creating or replacing your surface(s). We start by listening to your needs and goals. By going through the steps of the process required to achieve those goals, we strive to set up realistic expectations with no surprises. Since we understand how overwhelming the material selection process can be, we are happy to provide any support necessary to our clients. With the large decision and expense of choosing natural or engineered stone slabs, it is important that our customers make informed decisions. Once ready, we utilize the latest digital technology to template the space to ensure accuracy. From there, the information is transferred to our machinery and equipment, and then passed on to our craftsmen to turn your slab of stone into a beautifully finished piece. Our professional installers return to the project to transform your space into a work of art. 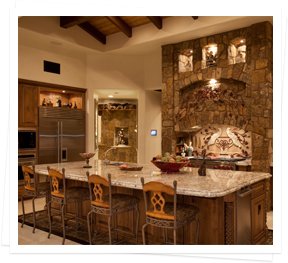 JDM Countertops, Inc. has worked on a wide variety of projects and is licensed both residentially and commercially. While most projects utilize stone solid surfacing for countertops, the medium can be applied to many other applications such as fireplaces, shower walls, tub surrounds, stairs, pools, fountains, water features, table tops, etc. The possibilities are endless. Please see our gallery for some examples. We specialize in custom solid stone honed or polished granite countertops as well as quartz, marble, soapstone, travertine, and more. The natural antibacterial properties and easy cleaning make stone one of the most popular countertop materials. Extraordinary elegance of eye level stone brings the out of doors inside in a soothing visual reminder of our beautiful planet. Stone wall surfaces can be home to niches, ledges and windows. A stone fireplace, either stacked or masonry, can be the focal point of your home, where guests can convene to enjoy the warmth of your home, hospitality, and hearth. Stone elements in your exterior combine with your landscaping to provide a peaceful retreat where one can enjoy a seamless transition between man-made structures and nature.